Look! All done. So easy. 2. The end! Did I tell it was easy? Store it at room temperature and keep a foam paintbrush next to the jar and you'll be ready to apply it to all of your many craft projects. Hooray! thanks! Works great :) AND saves money- that crap is so expensive! You just saved my life. When I have a weekly DIY budget this helps a lot! Although there are water-proof versions of decoupage, this is an imitation of the original, non-waterproof version, sorry! I'm wondering wheter this dries white or clear though. I always wait until after school sales are over and then buy bottles of glue for just pennies....easy peasy.. Always test one first to make sure it will work well, but the watered down glue (ie decoupage) works just fine on my photos. what size water? half and half? 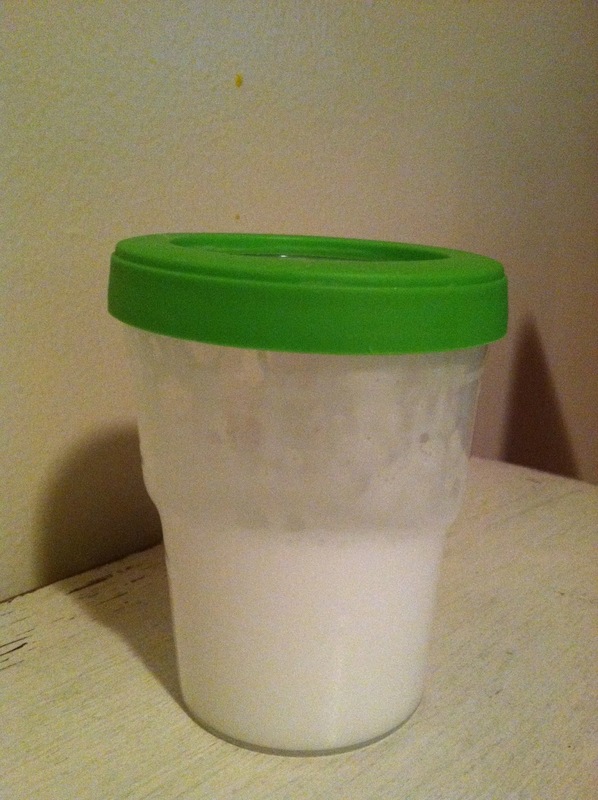 Two parts glue, one part water, so 2/3 cup of glue and 1/3 cup of water. water amount to glue, half and half? This works for gluing things down, but it's just decoupage. The mod podge most people know has a sealing agent added to it. It's worth it to buy the mod podge if that's what you want to do. The problem with this is that it's not for lasting. Yes, it will glue things down and do that great, but after time, it will not keep your projects together (kinda reiterating what Amy Baits was saying). It will also turn your projects color over time due to the combination. If you want just something to glue something down, this is great, but to make projects, use Mod Podge. In the grand scheme of things, it really isn't that expensive. I have my same jar for the past 4 years. If you do more than me, it's still going to cost less. 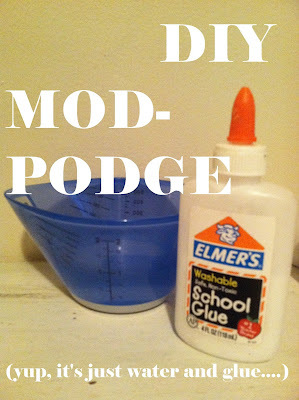 I tried this and it does work, but I don't think it seals like Mod Podge. I think their is some kind of sealer in the Mod Podge mixture. Going to try and figure out one day. The glue mixture takes longer to dry, your project is wetter, and if it get hot, it gets sticky. Maybe I did something wrong but I followed the directions. Yes - a water based sealer like polycrylic on top of your project makes it waterproof and seals everything. Thanks, but can i use this ''DIY mod podge" for transfer photo to wood, or something like that? You can use it to adhere photos to wood. Hi, thank's for the recipe! can i use it to transfer a photo to canvas as well? can i use it to transfer photos to canvas as well? can i use this for transfer photo to wood?? can i use this "DIY mod podge" for transfer photo to wood? Is modge podge the same as Decou page? Yes; but there are variations in them at the store- glossy finish, matte finish, etc. This glue and water version will give you a matte finish. You can use wood glue. Is white but after dries it gets transparent. We called a WIKOL /dictionary translates as PVA GLUE/. It is very cheap. I use it for gluing and painting and secure transfer and dequpage. Oh my goodness!i am so thankful to have seen this Pin!! As a photographer, I have been trying to master the perfect photo to wood transers. I tried several different gel mediums and mod podge among everything else, ended up being the best product thus far! (Which I tried first and didn't work cause I discovered it was the color of wood that was my biggest problem) So after many attempts and lots of money later, I am going through mod poge like crazy!! So this is PERFECT!!! THANK YOU SO MUCH FOR THE IDEA!!! So this works for photo transfers? No to glue sticks- sticky, but wrong composition.